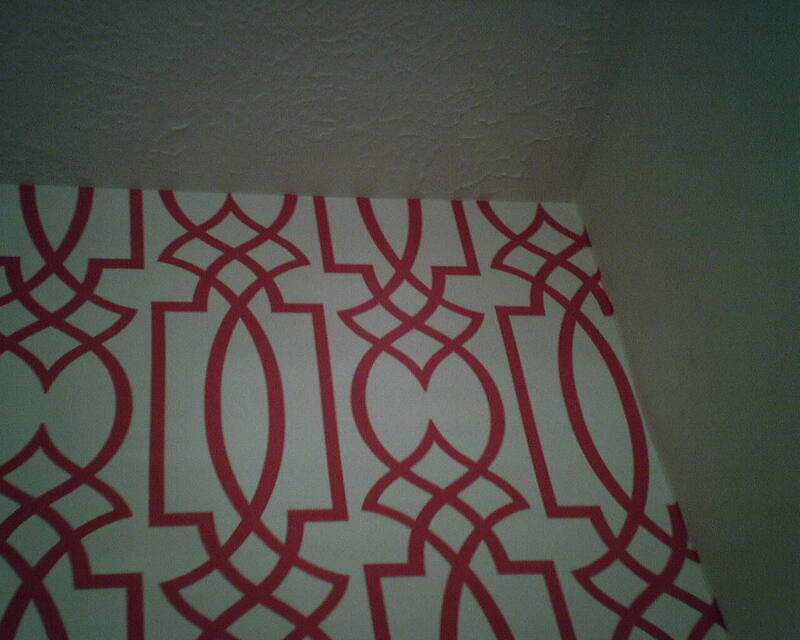 In the first photo, you see the right edge of a roll of wallpaper. Most of the time, the pattern crosses the seam, and has to be matched up with the coordinating part of the pattern on the next strip of paper. Here, the factory has cut the paper so the seam does not bisect any part of the pattern. I LOVE this!! 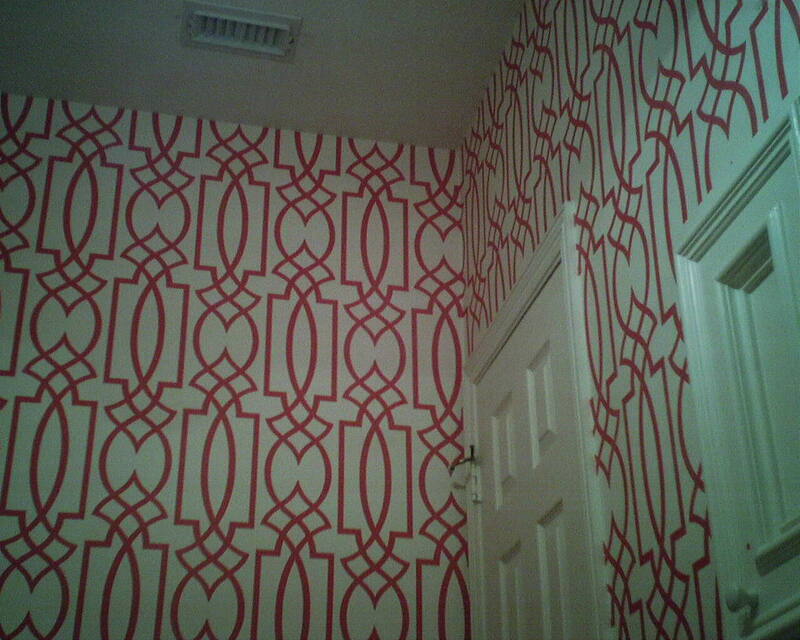 It gives me the flexibility to move the pattern up or down the wall, as needed. You see, almost all ceiling lines are not level, and if you hang your paper true-to-plumb, and match the pattern horizontally from strip to strip, you could end up with a pattern motif moving up or down the wall diagonally, instead of hugging the ceiling line. Because of that, I generally will not place a prominent design element at the top of the wall, but instead will put something that will be less noticeable, in case the ceiling starts go to crooked. 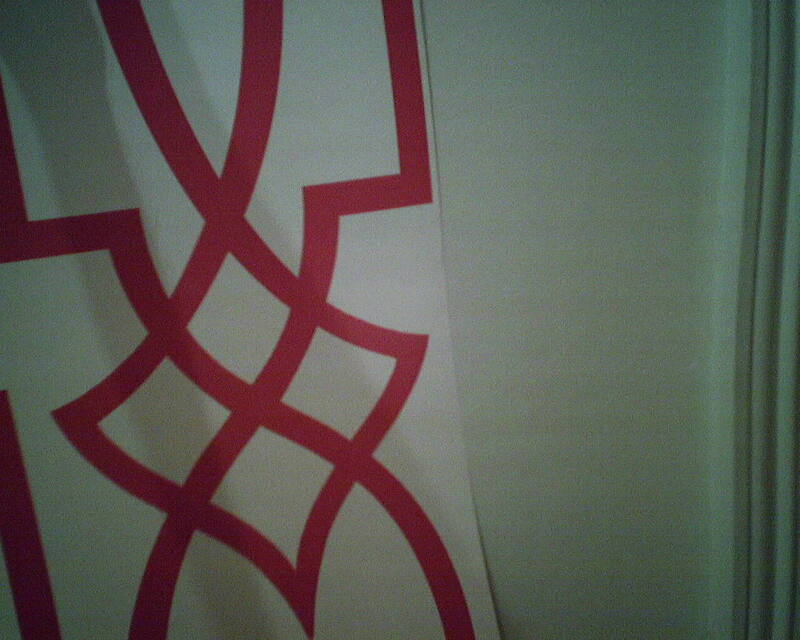 However, with this particular pattern’s seams having been cut in between the striped trellis design, I was able to position every strip so that the diamond motif was at the top of the wall. See Photos 2 & 3. This wallpaper pattern is by Antonia Vella for York Wallcoverings, and was bought at a discounted price from Dorota Hartwig at Southwestern Paint on Bissonnet near Kirby. (713) 520-6262 or dorotasouthwestern@hotmail.com. Discuss your project and make an appointment before heading over to see her. This entry was posted on December 9, 2014 at 3:58 am and is filed under Uncategorized. You can follow any responses to this entry through the RSS 2.0 feed. You can leave a response, or trackback from your own site.